What is the role of the Lavender tone in the bleaching powder? Does it have or offer any pigment control? Ask your self how can it, for control of pigment it must have a toning quality this would be neutralised by the lifting or bleaching agent! When lightening of hair or bleaching hair. Does this powder really control the pigment exposed when lightening hair? YES it does by gentle lifting the pigment correct formulation and timing essential. Does this added violet ingredient really help with lifting or is it just that colour of pale violet to give the illusion of pigment control? Hum! The bleaching of hair and indeed how to tone hair it’s a big topic. What is the best way to tone hair? Knowledge? Patients and skill of course and the right quality products! Personally I think that the pre -lightening of hair or bleaching is all about assessment consultation and then choosing and mixing a formulation that will deliver the lift required to expose the pigment that can then be controlled by toning to create the desired shade and tone. How do you tone hair? Lift and Tone. They do not happen at the same time so why would you apply at the same time ? In all my years of educating I have come across and indeed educated many products. I am still un-convinced that the violet blue hue plays a useful role as a pigment controller in the lifting process. I do however think it helps to control the yellow exposed from a visual stance this helps with assessing the level of lift attained prior to toning. Surly if the toner was in the bleach powder the formulation would kill or neutralise the toner pigment. 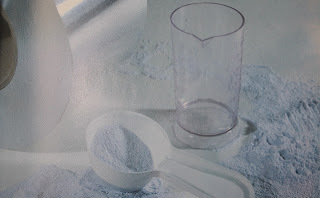 When mixing bleach powder follow instructions to get the ideal constancy this helps to prevent bleeding and over lap due to product expansion. Alway check with regard to using heat in the process. A simple test for this is Mix up a small amount of permanent hair colour now stir in a little bleach powder, now see what happens! wait for it………..Oops! The bowl of colour the formula you mixed just went black and muddy! Why? The bleach powder killed the colour pigment molecules. Have you ever had a bowl of colour and bowl of bleach on the same trolley? Have you ever mixed the bleach a little maybe created a little dust, then noticed dark spec’s on the surface of the colour formula! Yes? Why is this? Thats the bleach killing or neutralising the pigment! Be careful. It can happen so easily stirring it in does not help! Most powder bleach is designed not to make dust ‘ie’ Be heavy enough not to cloud up when being mixed. It some cases it is suggested that the bag or sachet be aggravated to mix up the content that may have settled with heavier ingredients falling to the bottom. We don’t want to breath this in in! health and safety is very important to stylist and client. It’s designed not to smell. The day is not far of when we will see bleach that is Silicon free! It’s designed to appeal as being safe gentle, suggest that it offers a gentle and controlled lifting out the hair’s natural pigment. All good stuff. But again the lavender tone does very little to control pigment as it lightens the hair lifting the pigment through it’s various levels. *Be Blonde Pur light cream activator family of products designed to deliver the very best looks and shades. Many hair bleaches have different ingredients and formulation! Do you ever read whats in yours?Always read the technical information provided. Ask your self is bleaching required? Could a high lift product work instead, some such as “Alterego Italy” Pure Diamond lift Be Blonde, will deliver up to 5 levels of lift, . Timing and formulation are essential and of course this is depending on the product being used. Provides complete control of natural tones. High definition.Exceptional cosmetic results. Infuses extra shine. Here is a generic list of whats in a product and directions. Dust free bleach powder with added violet tone for extra pigment control do not use on scalp above 20 volume peroxide Dust free very gentle will lift 7 shades max 45mins depending on developer used. Dust free bleach powder with added violet tone for extra pigment control do not use on scalp above 20 volume peroxide Dust free very gentle will lift 7 shades max 45 mins depending on developer used. Also available cream and oil bleaches you also need to know if a product is suitable for on scalp application always skin test for allergy and chemical reaction that can cause burning and in worst case for the hair to disintegrate this can happen with certain metallic salt based products so consultation is essential. What do we need violet, ash, beige, pearl, iris.? This is dependant on the lift achieved the pigment exposed and your target tone or shade. One must consider what is required to create a cool natural looking bleached Blonde. In other words how do you chose the formulation required to control unwanted yellow undertones! When thinking about toning bleached hair should one think about violet as a colour or tone are we thinking about the role violet plays in the hair colour process to control and re balance yellow pigment? Violet as shade or tone plays a much bigger part in hair colouring than one might think. But it’s almost behind the scene in the colour process. We have the lightening and bleaching process we expose pigment that we then have to control. Firstly with our natural or N series or natural series violet will always play a key role depending on the level you are working on and what your target colour is. As always to understand this we have to either look at the colour wheel or a chart. With the chart above you can see very clearly where and at what level violet comes into play from the numbers system on the left hand side we can see it’s plays a very big role in levels of hair from 8 to 10. Note: 8 in-fact will require extra blue pigment. Maybe your asking what role does it play? All hair colour is a balance of our primary colours. RED. YELLOW. BLUE. When blended together at any given level you will alway get a perfect natural shade balance at that given level. A natural level 8 will not be to warm or gold or to ash! Even when doing hight lights or partially lifting sections, as in shot below once desired level has been reached toning with be required. What changes this. When we lift hair with a chosen level of peroxide with lighten it this lightening process will expose the natural pigment in the hair. At our level natural 8 as we lift it I will expose yellow Orange [see chart] this warmth would be fine if you are trying for a warmer shade at level 8. If however you are trying to maintain a natural level 8 then the warmth exposed would have to be controlled. Remember we discussed balance well if we have exposed that warmth in our level 8. Exposing yellow and orange pigment we need to balance that off. To restore our Natural balance what do you think is required? what is lacking in the above formulation? What will re balance us back to our Red yellow Blue? Blue/Violet or Blue / blue red or B+B+R = Blue violet. A home use products to maintain that perfect shade condition and tone. Essential to bleaching and toning is home maintenance and condition products must be recommended to retain condition and control the shade and tone to stop it from getting brassy. Shampoo products and mousse toners are available for our clients now days. I hope this answers some questions if not feel free to post questions. This is quite a long topic but I hope those who read it find it useful Alter Ego Italy professional products are already having success in both the UK and all over Europe and its now ready to launch and be part of the Market in the USA/North America. It’s offering all the things that I hold dear passion and commitment to salon training and support. It has the support from being just one part of a much bigger entity that is striving for success in the salon and hair industry. The product line is very comprehensive offering professional products to cater for all needs of both the salon and the stylist salon products and retail support for the clients. Many new an exciting things are being launched and coming on line via their web site Alter Ego Italy and various social media platforms. For Alter Ego Italy products and information Contact Paul Farrell for information or product in the uk. All the Alter Ego Italy products are available for delivery to UK and Ireland from www.kreativesalonsupplies.com. The salon and the S word now available in book and e book format for links to purchase and reviews Click here or on the image.